By any other word would smell as sweet.’. So, call it whatever you like. I love this recipe, it’s versatile enough to be either. Ice it and call it cake, or leave it naked and call it bread, it doesn’t really matter because it’s yummy either way. When our girls were little, I would make a whole batch and end up with a cake and at least a dozen or so muffins. These days I only make a half quantity and those are the measurements I’ve provided below. This half quantity is more than enough for Dean and I and perfect for a medium sized loaf tin. When baking the bread, it’s important you be aware of how your oven deals with cooking and either increase or decrease the cooking time accordingly. As you can see by my featured image, my oven split the top of the bread as it baked. I guess I can forgive myself for this as I’m still learning the technicalities of my new oven that employees some special ‘fandango’ 3D heating process. Next time I’ll remember to lower the temperature and cook it a little slower. step one: Pre-heat the oven to 150°C (300°F) and prepare a standard sized loaf tin by coating the inside of it with butter and dusting with flour. step two: In a large bowl, sift the flour and baking soda. Make a well in the middle and set aside. step three: In another bowl, mash the bananas until all the lumps are removed. Add the eggs, oil and sugar and mix well to combine. step four: Add the banana mixture to the bowl containing the flour and carefully mix to avoid spilling the flour. Once combined, give the mixture a good beating. It’s ok to do this by hand using a sturdy wooden spoon. Add the walnuts now if you are including them. step five: Pour the batter into the prepared tin and place in the oven for 1½ hours. Test with a skewer after 1 hour and again at 1 hour and 15 minutes, cooking for additional time only if necessary. step six: While the bread is cooking, place all the ingredients for the cream cheese icing into a bowl and mix until smooth. step seven: When cooked, do not turn it out of the tin immediately. Leave it in the tin and place it on the cooling rack for at least 20 minutes. When the tin has cooled, turn the bread out and leave to completely cool. 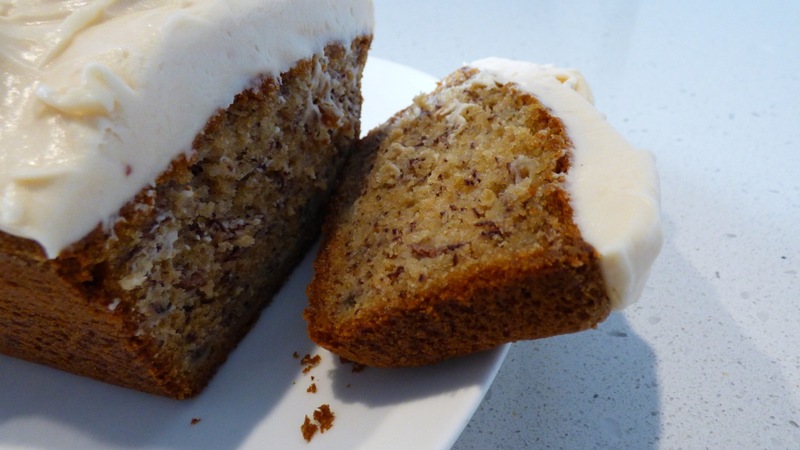 Use old, over-ripened bananas for a full-bodied banana flavour. Any jam can be added to the icing. All ovens vary, be aware of how your oven cooks. Overcooking will make the bread dry. Remember, I’ve written this recipe out using half quantity measures. You can successfully double the measurements, but you do not need to double the cooking time. You may need to cook it for the entire 1½ hours. 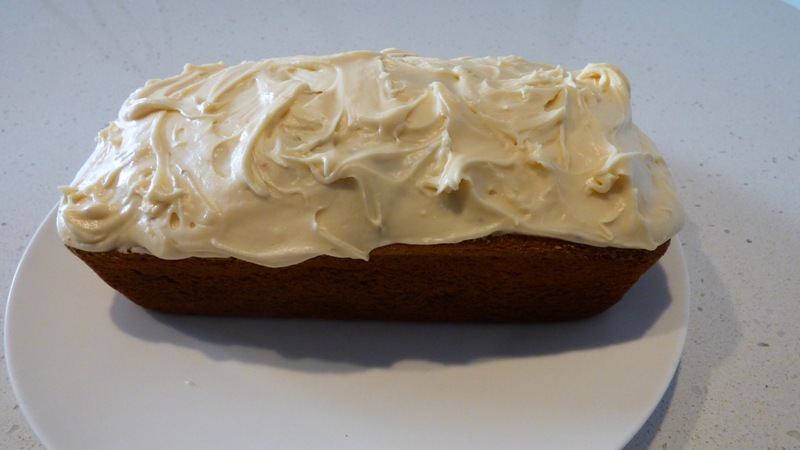 As you can see, this time I chose to slather lashings of cream cheese icing onto my bread when it cooled. Cake is a treat we don’t have very often so it was a little indulgent of me and it was very yummy with my coffee this morning. Oh! Thank goodness I’ve already eaten! That is SO tempting!!! Looks beautiful Mum! That icing looks delicious!